This past weekend EHK had to work quite a bit. I really don't like it when he has to work on the weekends because it takes away from such a nice respite. Afterwards, we didn't quite know what to do for dinner. I had thought about dropping by the Fish Market to pick up some Kumamoto oysters (and whatever else was good) since they had them in stock. 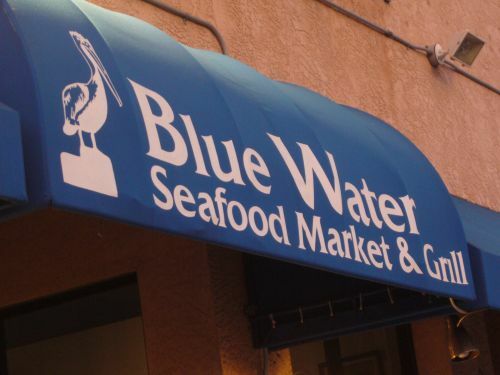 Then EHK mentioned Blue Water where he and the boys met up a few days ago to catch up and grub. I was instantly interested since I had missed out so I met him at his work and we headed on down. I was warned that this was not a fancy place. I guess he and the boys were mistaken about what type of place this was. One of them came in a tuxedo shirt and EHK ironed one of his best shirts for the occasion. Despite the very casual atmosphere I was assured that the food was excellent. It's an order and pay type place but they do bring the food to your table. EHK did all the ordering and I perused the fresh seafood case. They had a very nice, fresh selection and I'd definitely stop by and buy some if I were in the area in the future. The first dish to come out was an appetizer of a half order of Washington(?) 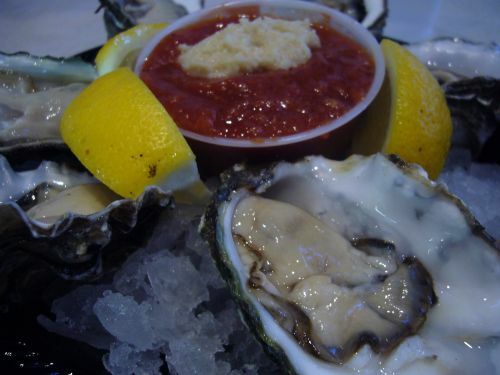 oysters ($10.95). So I've heard from most people that oysters should be consumed swallowed and not chewed. I personally don't understand how you can get a maximum feel for the flavor without chewing. After all, chewing and macerating the food is part of the tasting and digesting process. So you can count me in as a chewer while EHK is a swallower of oysters. The oysters were very fresh, meaty, tender and sweet. A nice alternative just short of going out and nabbing your own oysters. EHK ordered a Seared Blackened Ahi plate ($17.95) for me. 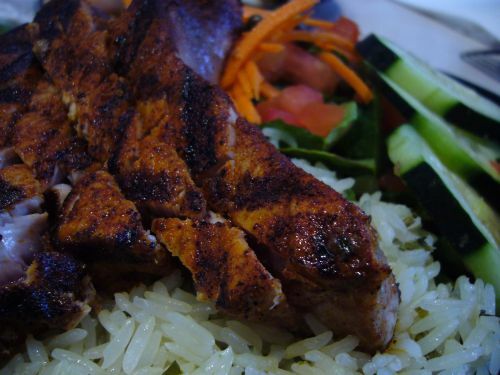 It came with buttery basmati rice and a fresh chopped salad. The Ahi was well seasoned and incredibly tender... so tender that you could just cut it with the fork. The rice it came with was equally as tasty. The perfume of butter caught me and I think I'll be asking for double portion of rice to replace the salad next time. Don't get me wrong, the salad was good and cleansing after the tuna and rice but the rice was YUM. EHK ordered a Calamari Steak Sandwich ($6.95) but he shared half of it with me (I shared half of my plate with him so no I wasn't food hoarding). I was kinda hoping that this sandwich would come with some fries but I didn't read the menu thoroughly as it didn't and we didn't feel like getting back in line to order some. 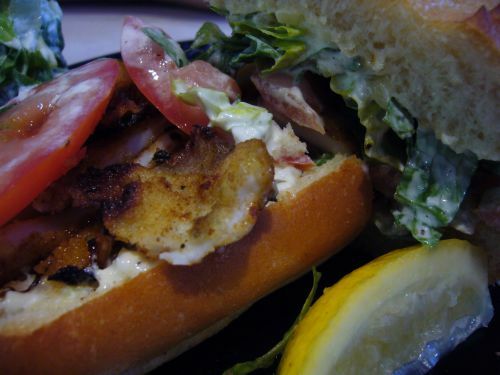 The sandwich was very tasty- the bread was toasty and filled with tender, breaded calamari steak. There was quite a bit of tomatoes and I'm not fond of eating it in a sandwich as it makes the sandwich slide around. Ever get to the end of a sandwich that had tomatoes in it and you left with an uneven amount of bread and filling? It bugs me so I just eat the tomato on the side. Looks over mayo-ed right? I'm one of those people who actually likes a lot of mayo/spread on my sandwich so it didn't bug me at all. EHK says the clam chowder isn't so good here but the food that we did eat in this review was tasty so I'll recommend the above dishes. Catch Me in the Bay Area!